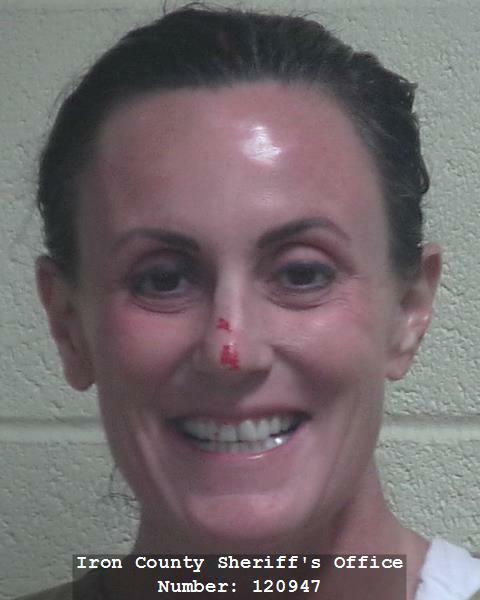 ST. GEORGE – A Cedar City woman was arrested Saturday and charged with felony offenses after setting fire to “everything” her apartment and biting a medical doctor. Police responded to the report of a suspicious incident – the sound of a window breaking – at the Mountain View Real Estate building at 2045 N. Main Street in Cedar City Saturday afternoon, according to police records. Responding officers found a window had been broken out and believed the person responsible was still inside. One of the officers also smelled smoke coming from the building and saw someone throwing items out of a window. The suspect, a woman later identified as 47-year-old Ericka Nichols Gillette, was seen exiting the building with a large painting in hand. She also ripped electrical cords out of the back of the building, the officer wrote. Gillette walked up to a locked gate near the police officers and started hitting the gate. She then turned around and started walking away while officers continued to tell her to stop. Due to her ignoring police commands and destructive behavior, the officer used his stun gun against the woman and incapacitated her long enough to be taken into custody. Officers continued to see and smell smoke coming from the basement of the building. “Before entering the building, for our safety, officers asked the suspect what was on fire and she replied, ‘everything,’” the officer wrote. When asked if she had used gas in starting the fire, Gillette said she had. Officers learned Gillette lived in a basement apartment of the building that she had had apparently set on fire. Cedar City Police Sgt. Jerry Womack told St. George News Tuesday that smoke from the apartment was mostly coming from items inside that Gillette set fire to and were smoldering. Womack said he was unaware of any structural damage done to the building from the fire, which was handled by the Cedar City Fire Department. In the presence of officers and medical personnel, Gillette said she had taken a mix of opiates, bath salts, marijuana and alcohol. After being taken to the Cedar City Hospital for medical care, Gillette bit the doctor who was treating her, according to the statement. For setting a “habitable dwelling” on fire and biting the doctor while in police custody, Gillette was charged with a first-degree felony for aggravated arson and a third-degree felony for an assault by a prisoner. Gillette has a preliminary hearing May 23 in 5th District Court. Lol! She lost her mind. I’m laughing at her booking photo. Bath salts. Same thing that guy in Florida was on when he ate another man’s face. Bad news. You’re dealing with psych patients you know are severely psychotic and out of control. I believe the biting charge is unreasonable in that respect. She should’ve been in restraints. Stuff like this is more sad than anything. Same with the guy that broke in the temple. These people need psychiatric treatment. The LDS way around here is to lock people in cages like animals if they don’t conform–what is it, purgatory prison/jail? We can do better. It’s shameful. ok, and this one was drug induced. Don’t pretend to be a mental health specialist. It doesn’t become you. Oh no, no, no. I know this person, she’s been a friend for over 20 years. This is not her usual behavior and I do believe that she struggles with bi polar or a similar aliment. She’s a great friend, mother and human being. Please know this coming from someone who knows and cares about her. Please don’t be so unkind to someone that you do not personally know. Did she screw up, Yes, Yes she did and I’m certain she will face those ramifications head on. I know she will be utterly horrified and embarrassed by her behavior too. I would never have expected this level of substance abuse from her. I find this very tragic for one so kind, smart and gifted. I will be checking in with her and her family to offer her my support. I cannot understand it, but I care about her and will support her in her recovery. Please people, there are many people struggling out there that need your friendship, not your ridicule. You’re all making fun of people when they are not well, that never helps and frankly makes you look like the bad guy. You cannot say that there’s a need to increase the availability of Psychiatric care, and then bash them in the same sentence. You’re exacerbating the problem in this country that view people in need of that care, as less than deserving of getting well and being happy. They are only humans with faults, as we all are. Please be kind whenever possible. It’s always possible. Well, she needs to be in a rehab or a psychiatric facility. And not just one of those that turns people out after 1 or 2 nights. Do not let the St George News trolls bother you. They do this on virtually every story. It’s like their hobby. So worthless. I’d love to see some of them make these comments in person instead of online. I’d assume you would have to be on something to begin with to even consider doing bath salts. I just keep thinking of that story a few years back where some guy ate another guys face, no bueno.